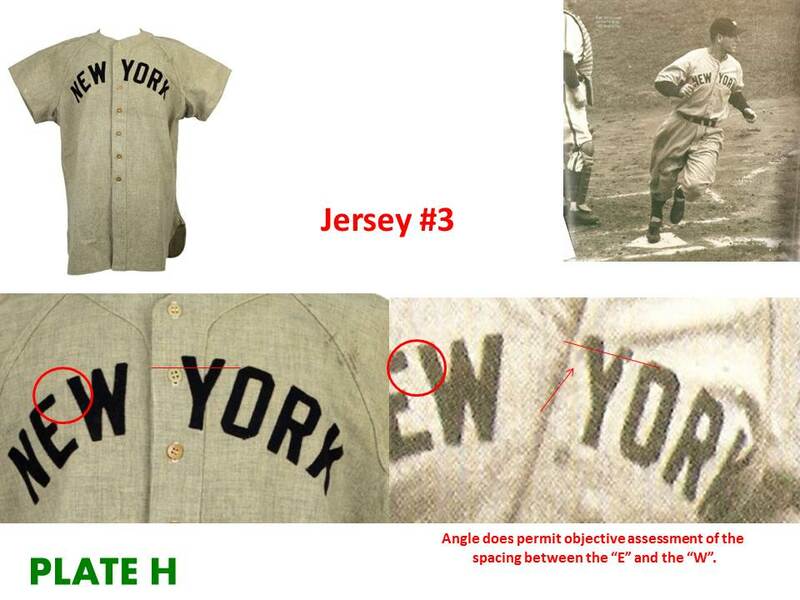 This piece is offered as follow-up to my previous article and commentary on the nature and quality of the work offered by Rob Lifson and REA on the 1938 Lou Gehrig New York Yankees Road jersey that I evaluated. Today I want to focus on process and product without the unnecessary background noise that comes with REA’s involvement in the research and evaluation of this jersey. I am going to take you through the essential relationship that exists between exclusionary and imagery analysis as it pertains to definitive photographic attribution (“Photo Matching”). “Photo Matching” is a phrase I have come to detest and I hope by the end of this article, you will see why. 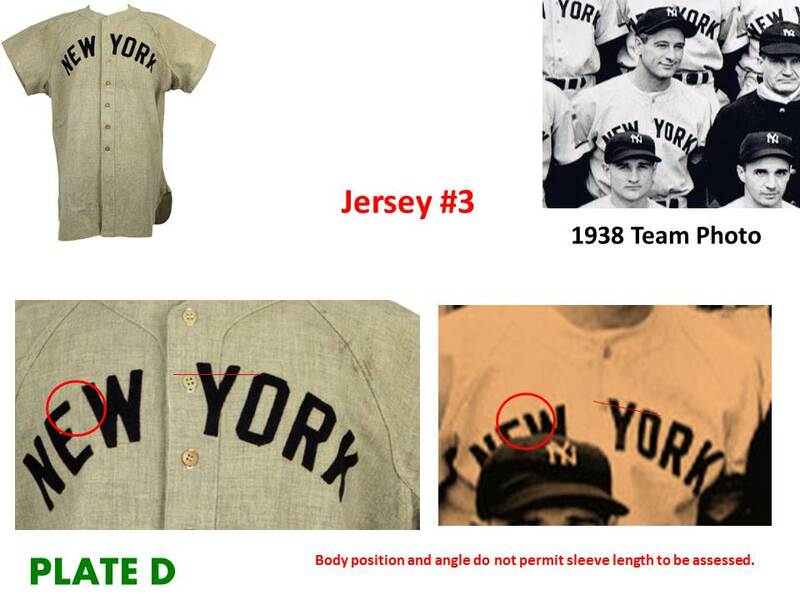 Additionally, I also want you use this jersey as an instructional vehicle on process, and by taking you through this process in what I feel is a responsible manner, also help you to see this product (1938 Lou Gehrig New York Yankees Road Jersey) in a more informed light; nothing more and nothing less. Notice I did not say 5 uniforms were ordered for each player each season. What I am saying is that you have to have some idea of how many uniforms are in play before you start playing around with your “photo matching”. It has been my experience that most folks find something specific they are looking for and stop their research when they have convinced themselves they have found it. If this is your “photo matching process”, then as a trained analyst, I have problems with this and I think you will see why in short order. -Elmer Fudd likely had 3-5 jerseys available for wear throughout the entirety of the 1956 season based on what we know or believe about ordering/inventory patterns. -Through imagery analysis, we have identified and accounted for at least 3 separate jerseys worn by Elmer Fudd in 1956. -Imagery analysis has permitted us to exclude 2 of the 3 jersey worn by Fudd from being the one offered for consideration. -The one remaining jersey is consistent with images available of Elmer Fudd from 1956. -While the probability might be high that the offered jersey is the one Fudd is wearing in photographs from 1956, no definitive claim of direct photographic attribution is made because there are other possibilities that have not been accounted for an excluded. I take the time to lay all of this out as a both an educational and cautionary message to this hobby/industry because before someone runs off and claims a “photo match”, it is essential that they first identify what they know about the known or likely population and then physically demonstrate how these various jerseys have been identified and distinguished from one another, and then “excluded” from consideration. When this is not done, any claims of direct photographic attribution (“photo matching”) are not objectively or statistically defensible. 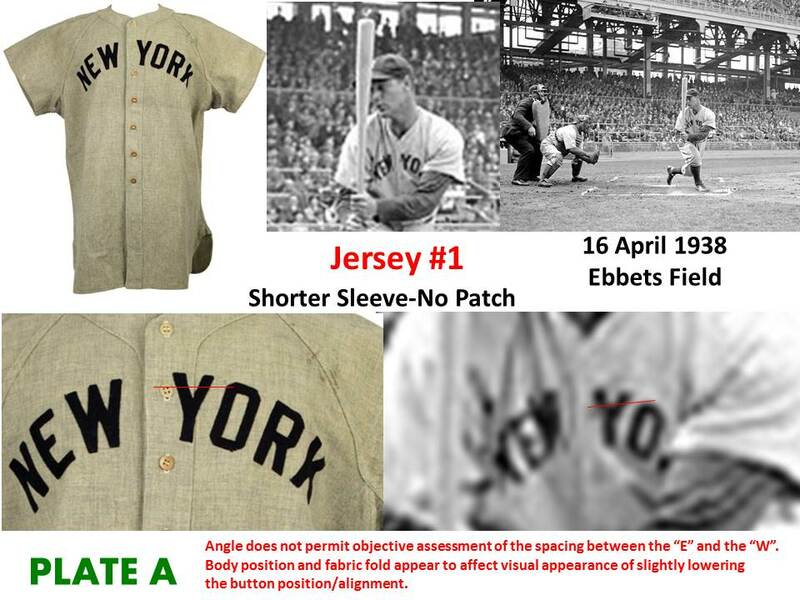 What follows is a combination of imagery and exclusionary analysis as it relates to the 1938 Lou Gehrig New York Yankees road jersey being offered by Rob Lifson and Robert Edward Auctions (REA). I think it very important to note that this work includes analysis of images I did not have or had not seen at the time my original opinion was provided. The overwhelming majority were located and provided to me by Mr. Peter Nash and for that I am extremely grateful. In my opinion, it is not unreasonable to presume this image is from one of the previous road games (although it could be from any time prior to the 23rd of September as well). This jersey is also consistent with the image from April 16th of 1938, so I do not disqualify them from being the same jersey. 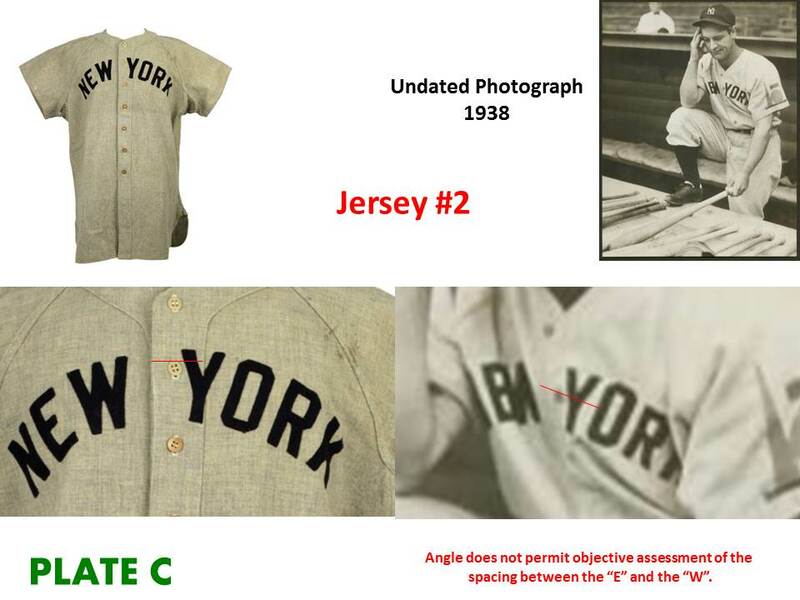 You will also notice that this jersey does not feature the World Fair Patch worn by the New York Yankees, New York Giants, and Brooklyn Dodgers in 1938. 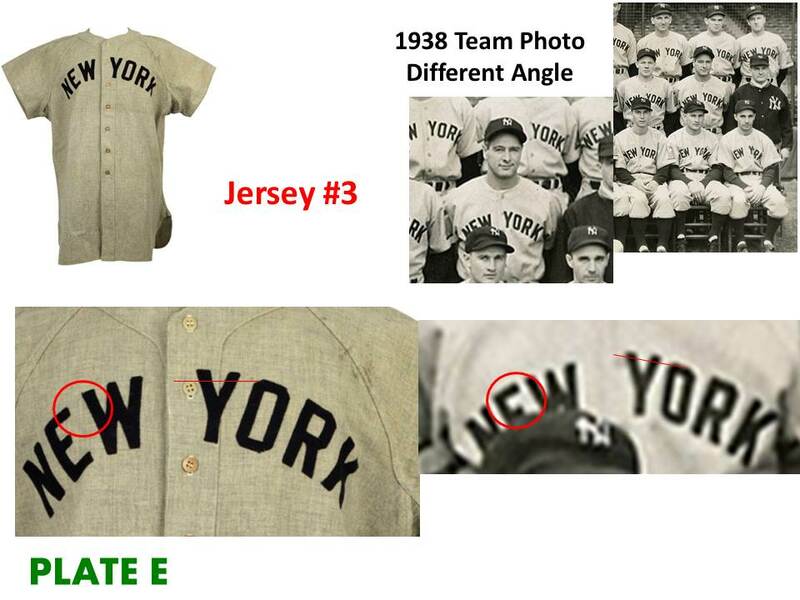 Jersey #3: Jersey #3 refers to those images that I either believe to be or can be shown to be from the 1938 World Series. I attribute the 1938 team photo to the World Series based on the fact that the Yankees are appearing in road uniforms and the 1938 World Series opened in Chicago. This would not be an uncommon event for a team to pose for such a picture. 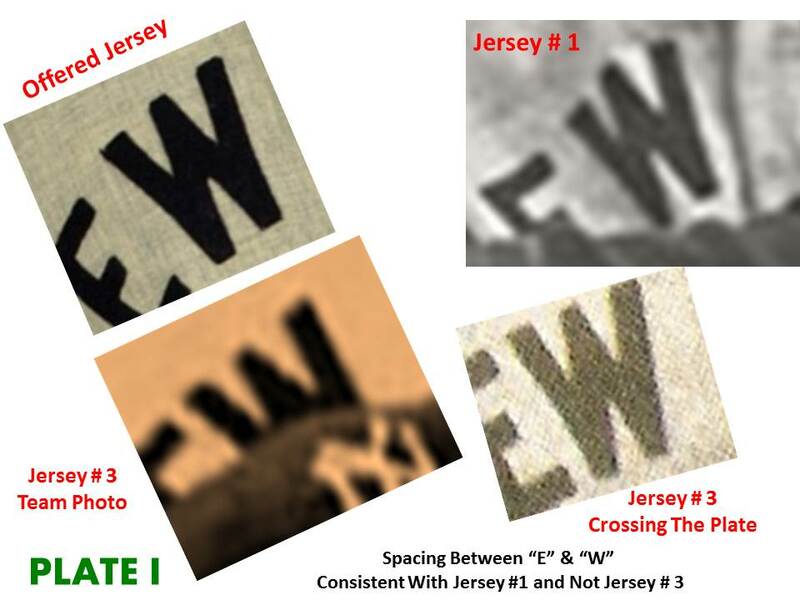 The composite details (both physical and those affected by angle of image) of the jersey identified as Jersey # 3 are such that I cannot exclude them from being the same jersey. 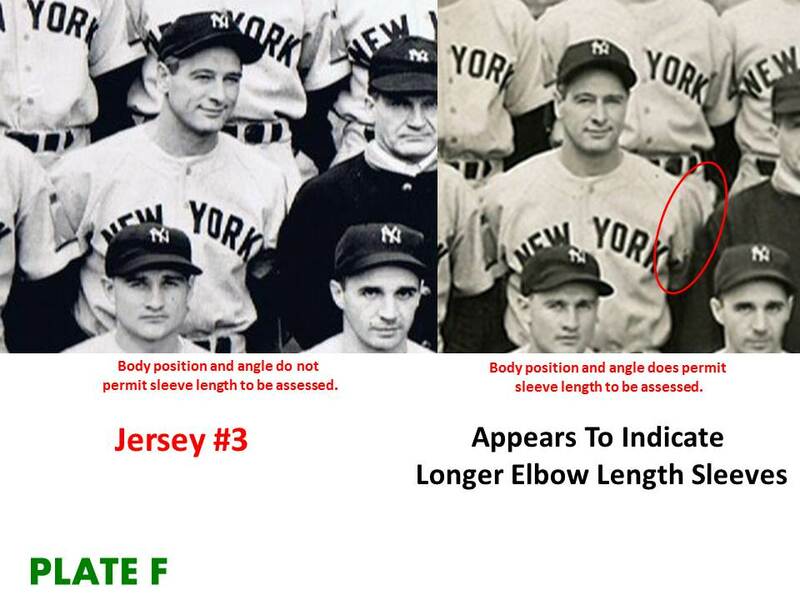 Additional images of the team photo from different points of reference confirm that the sleeves Gehrig is wearing in this picture are elbow length, which is not consistent with Jersey #1 or Jersey #2. I also exclude Jersey #3 or any other jersey with long sleeves and the World’s Fair Patch from being the same jersey as Jersey #1 or the offered jersey. The fabric cuts that I found on the offered jersey are in a location that would limit the application of that patch to have being placed on a jersey of longer sleeve length since the World’s Fair Patch was sewn to the bottom of the sleeve. -Both the offered jersey and Jersey #1 share a common sleeve length. -Sleeve length is a discriminator based on the chronology of the photographs. 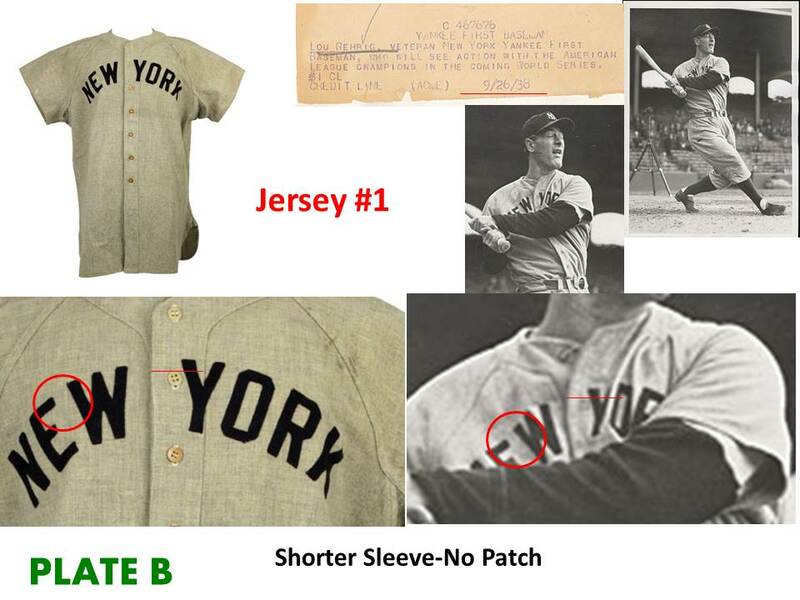 -Both the offered jersey and Jersey #1 can be seen without the 1939 World’s Fair Patch. What a combination of imagery and exclusionary analysis indicates to me is that the offered jersey could be Jersey #1. 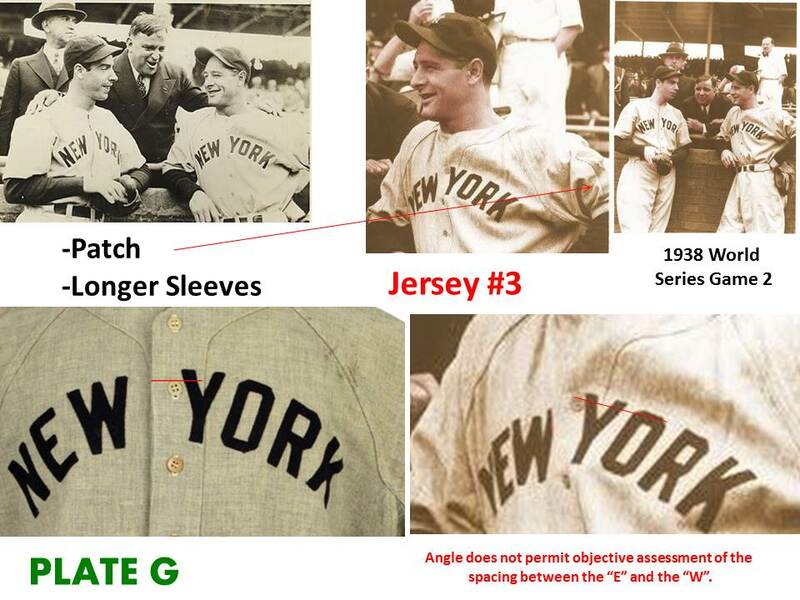 In addition, since we now have images of Gehrig wearing a jersey without the World’s Fair Patch, it is quite conceivable that no patch was ever applied to the jersey and that the location of the fabric cuts is a coincidence. This would not have any appreciable impact on my overall opinion of the jersey and would only affect the overall grade assigned MEARS by +.5 since the A9 opinion provided by Dave Bushing did not deduct points for this. In my opinion (A5), I deducted -1 for the patch. Thus a revised grade of A6 from me would leave the aggregate grade at A7.5 (average A6 & A9) as opposed to A7. This article has been about two separate but related issues; process and product. My hope is that the hobby/industry now has a better understanding of the essential relationship between imagery and exclusionary analysis when it comes to supporting a position of direct photographic attribution (“photo matching”). When the collecting community or auction houses conduct or subsidize substandard work, process, and analysis, then we should not be surprised when it results in “photo match” claims that are not objectively or statistically defensible. Please know for my work in this area, I leverage no special tools or technology. If you are looking at the images on a computer screen and care to invest about $1.00 in a clear ruler you can lay on the screen, then you are armed with the same tools as me. This only leaves differences in experience, training, and process. This article has also been about a product or the ability for the collector to see and know as much as possible about a particular jersey. In the case of this 1938 Lou Gehrig New York Yankees Road Jersey, I maintain my original position that “based on my physical examination of this jersey and supporting data, it is my opinion that this jersey posses all of the characteristics you would expect to find in a 1938 New York Yankees road uniform supplied by Spalding for use and wear by Lou Gehrig during this period”. 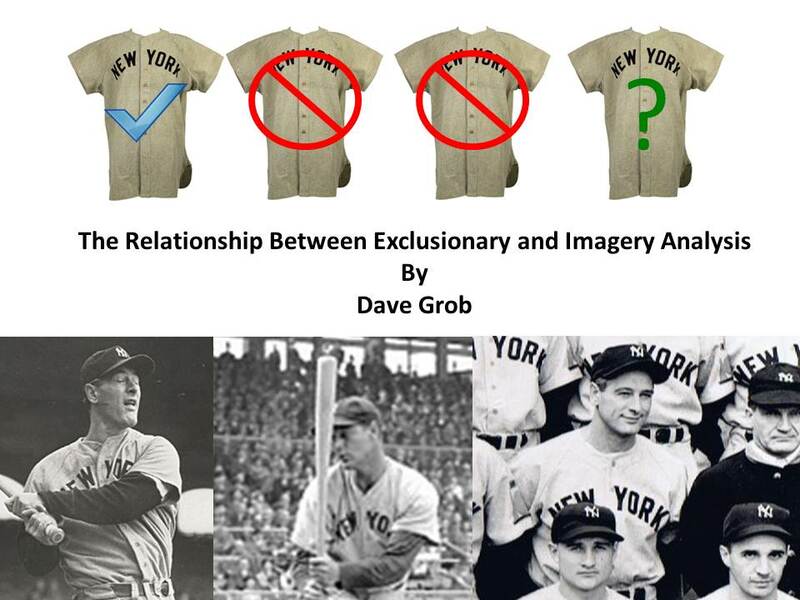 -Comparative trend analysis with other Lou Gehrig and period New York Yankee jerseys I have examined. -Comparative fabric analysis with other period and year specific Spalding major league grade/quality uniform products. -Exclusionary analysis to determine a likely population and offering data to support either the possibility of exclusion or inclusion with respect to the issue of direct photographic attribution. -A physical examination of the jersey utilizing UV lighting, a light table, illuminated magnification, and the use of a digital microscope. I also maintain my previous position of that “if you are serious buyer then take this jersey very seriously. Although there are some condition issues, it is one of only a handful of legitimate Lou Gehrig jerseys out there and the likely population of good Gehrig jerseys can only to get smaller. This population has been cut down significantly as I have evaluated three others that were found to be problematic for any number of reasons. If you are in the market, then buy the jersey for what it is based on what you can objectively see and know. I think you’ll be thrilled and lucky to have it as the display appeal is incredible and the conservation work in the sleeves is museum quality”. As always, collect what you enjoy and enjoy what you collect. Now this is what you call examining it with a fine tooth comb ???? ?